Everyone has gone cloud these days. All the big companies are offering it. So it comes as no surprise then that individuals would want their own cloud too. And for those people there’s ownCloud! I installed ownCloud 4.0.4 in my shared hosting account. It worked on the second try (it would have worked on the first try if I had followed my providers instructions for configuring PHP first). The fact it worked so quickly, without any fiddling around, is a very good sign. I also installed the synchronization client on my laptop. The basic functionality included in ownCloud is quite impressive. And version 4 brought a lot of great new features. Of coure you can synchronize your files (and if they’re media files you can play them back using the integrate web player). There’s also Contacts, Calendars and a Picture Gallery enabled by default. There’s a lot more you can enable out of the box, including Tasks and External Storage (such as DropBox and Google’s gDrive), and Bookmarks. 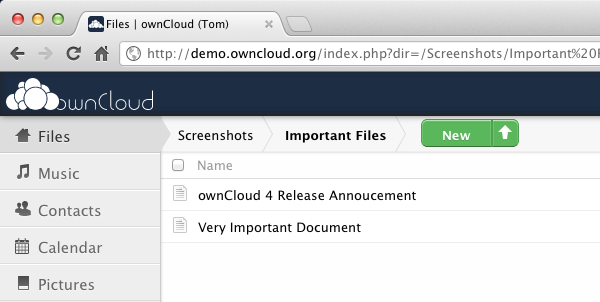 For more advanced functionality ownCloud offers an API and an app store for user’s to contribute their own extensions. And there’s quite a few interesting extensions already available. ownCloud is written in PHP (requires version 5.3) so you can pretty sure it will run just about anywhere – PHP is available on all OSes and every shared host I know includes PHP in their most basic plan. It also requires a database but fortunately it supports SQLite (as well as MySQL and PostgreSQL) so even if your hosting plan doesn’t include a database you’ll be fine for three or four users. Yes, ownCloud is mutli-user! So you can set it up for your whole family, your friends, or organization. I was somewhat disappointed by a couple things in ownCloud though. First of all I found some basic things missing or counter-intuitive. And occasionally navigation doesn’t seem to work (ex. : adding a date to a task brings up two different calenders depending on where you click; the button to add a photo to contact are not always visible; etc.). This is polish that will come but makes wonder if basic testing is being skipped. I’m a bit more concerned but some of the fundamental things which I don’t see. Like the synchronization client doesn’t support proxies! This means you can’t sync from the office (I don’t know any company that doesn’t have a proxy/firewall). Also the advantage of PHP is mitigated by the fact it’s not a long-running process, so every request to ownCloud kicks off a new PHP script. That mean’s it slow(er). ownCloud is a great idea with some great implementation and a good foundation. I expect a lot can be done by third parties using the hooks built into the software and the API provided. But at the moment I don’t think it can replace my SugarSync account or win anyone over from DropBox, gDrive or iCloud. I am looking forward to version 5 though. Assuming they not only add the promised features but also polish up the existing ones.